It was in the holy month of Ramazan 65 years ago in 1947 when The Viceroy of British India, Lord Mountbatten, read out the proclamation of Independence of both Pakistan and India issued by King George VI. Thus, Pakistan came into existence in the month of August and, according to the Islamic lunar calendar, it was the night of 27th Ramazan, one of the most sacred nights for Muslims. It seems as if every other person has a Facebook page selling either goods or services. Almost like an epidemic, the craze of online buying and retailing has spread among the internet savvy group in the city. Kolachi takes a look at online T-shirt retailers and their creative design campaigns this month. August this year has brought with it two significant events, Ramazan and Independence Day, and online retail outlets generally run by young university students responded accordingly. A number of customized Ramazan-Independence Day T-shirts with catchy one-liners are on sale just a click away. It is not often that the Islamic lunar calendar coincides with the Gregorian calendar as it has this year. For the last few years, the holy month of Ramazan has been falling in the month of August and due to the sanctity of the month, when a majority of Muslims fast and refrain from many activities, Independence Day celebrations of Pakistan have been relatively muted and are not being observed as enthusiastically as earlier. Apart from the activities of adults on the occasion of Pakistan’s Independence Day, the celebrations remain an important event in the academic calendar of both public and private educational institutions in the country as almost every school prepares its pupils for the day, holding debate competitions, flag-hoisting ceremonies and other activities to apprise the students of the struggle their forefathers carried out to get independence from the British Raj. Unfortunately, this year the Independence Day activities for students as schools have been badly affected not only due to the holy month but also owing to poor planning of the education department. Most government schools are closed for the entire month of August as part of the summer vacations, independence activities at schools are not being planned with traditional fervour. 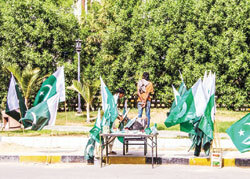 Although the students of Karachi University and NED University of Engineering and Technology prepared and hoisted a 140-meter-long national flag as part of the Independence Day celebrations, their activity did not grab the attention it deserved. It also failed to inject energy into the lethargic mood of the nation, which goes into virtual hibernation in the month of fasting. 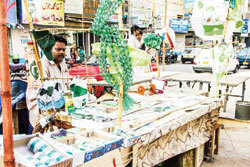 On the streets, some stalls selling national flags of different sizes, badges and emblems have been set up in certain parts of the city but according to owners of these stalls, they are not getting too much of positive response from youngsters, who otherwise, throng the outlets to buy the national flags and other independence day paraphernalia and prepare for the day in the month of August every year. “You will hardly see any car or vehicle with the national flag on it while homes have not been decorated with emblems so far. 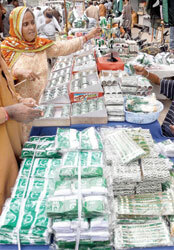 All this is due to the month of fasting when parents are busy with iftaar and sehri and taking their families for Eid shopping,” Abdul Quddus, an elderly person who sells national flags and other items every year near Water Pump Chowrangi, told Kolachi. 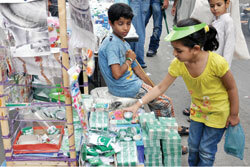 Quddus said he had started selling flags, badges, emblems and armbands bearing the Pakistani flag since the first of August but so far he has managed to sell hardly a few flags and some badges. To add to his woes, many children were not going to schools due to the summer vacations while their parents were too busy in Ramazan and Eid related activities to devote much time to the upcoming Independence Day celebrations. Meanwhile, both the state-owned and private electronic media has also not been as enthusiastic about Independence Day celebrations as it used to be in previous years. The relative lack of August 14 coverage has also added to the lack of enthusiasm among the masses this year. Abdul Shakoor Nizami, a retired educationist who organises Independence Day activities every year on August 14 near his residence in Azizabad, blamed the Ulema and prayer leaders for the poor public response towards the celebrations, saying the prayer leaders were asking the faithful to celebrate Independence Day on the 27th of Ramazan by offering prayers, reciting verses from the Holy Quran and distributing sweets in mosques instead of 'wasting their energies on singing songs' on August 14. “I have often heard from the Ulema that fortunately, Pakistan came into existence in the month of Ramazan and the date on the Islamic calender was the 27th so instead of singing national songs and indulging in other ‘futile’ activities, the people of Pakistan should celebrate independence in an Islamic manner, by offering prayers at mosques and homes,” he observed. Nizami made it clear that he was not against offering prayers for the well-being of the country and its people in the holy month of Ramazan but added that other activities, which are normally held in schools and colleges, including the singing of national songs competitions, quiz shows and tableaus, should also take place to create awareness among youth and children about their history. “And then there are non-Muslims, including Christians and Hindus, who are just as loyal Pakistanis as Muslims but they don’t keep fasts in Ramazan and should celebrate Independence Day according to their own traditions,” he observed. Some critics of this view believe that because Pakistan was a gift from the Almighty Allah to the Muslims of the Indian subcontinent that was granted to them in the holy month of Ramazan they should celebrate Independence Day in a more Islamic manner, by going to mosques on the 27th of Ramazan, offering nawalfil, helping the poor and seeking the forgiveness of God. They believe that the government should celebrate Independence Day every year on the 27th Ramadan. 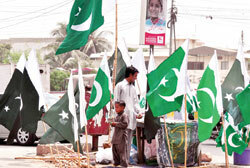 The increasingly polarised debate on whether Pakistan’s Independence Day should be observed according to the Islamic or Gregorian calendar only reflects the fact that at the moment, the nation is divided into various sects, castes and races on the basis of linguistic and religious identities. Unfortunately, the most important event for the country is being largely ignored or downplayed both at the public and governmental levels, which should be a cause of concern for the well-wishers of the country. ‘Not only Perfect but Pakistani too’ and ‘Pakistan- No place like home’ are two of the five T-shirt designs that an online brand which calls itself Faalsay is offering. “We just did kurtas for girls on our page before, but when we started doing customized T-shirts the response was overwhelming,” said Rama Siddiqui, one of the founders of the brand and a young medical student. The reason she believed was the fact that kurtas just went to a small market segment - young girls - but with T-shirts and the Independence Day mood men, boys, girls and little kids - everyone wanted to buy one. 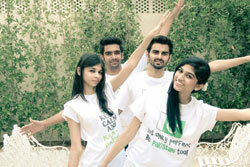 ‘Keep Calm and Naara-e-Pakistan’ is a T-shirt a young girl in a cross legged yoga pose sports on their page. The campaign is creative, it involves four friends; two guys and two girls together. They sit in a lawn and talk, they laugh, they high five, wearing the T-shirts on sale and more importantly share a bowl full of faalsas. The brand is endorsed. “We came out with a video shoot too,” shared Feryal Shahab, co-founder for the group. The video has the same youth appeal: four friends wearing the Independence Day T-shirts go out on a drive. They end up sitting on some rocks by the sea, sharing a bowl of falsaa. The online brand which started only six months back has received 50 orders for these tees in the last couple of days, “More were coming, but we had to refuse. We’re both studying, and there is only so much we can handle,” laughs Feryal Shahab. Another online brand with the name of KoncepTees offers ‘Pakistani’ T-shirts too. They have 14 designs, each on either a black or white background. One of them has ‘Meri jaan Pakistan’ splashed across it in a green Urdu script. Another has ‘The world’s greatest Pakistani’ written on it. A group of students from Bahria University have come out on their Facebook page with what they call ‘their Ramazan collection’. Each T-shirt comes with a catch line for the month, which talks about spiritual matters such as belief and prayers. A particularly interesting design has a half-charged battery on it. Underneath, in neon green, it reads, ‘Ramazan - time to recharge’. Another says ‘five salah for falah’ written on it. Two more say, ‘Smile because it’s Sunnah’ and ‘Everyday I am Muslim’. The companies come in with a photo shoot, friends and volunteers who agree to pose wearing the tees. Though amateur photographers and models, the shoot has all the spice of a successful marketing campaign. They are chic, carry everyday faces and appeal to the tech savvy youth. One of the reasons for the success of these online retail outlets is they cut down the cost of running a shop. The cost benefit as a result is passed on to customers. The T-shirts are cheap (Rs 500-750) and they cannot come at your doorstep. To order, one only has to email the group. The companies generally deliver through a courier service, and there is cash on delivery. The T-shirts are close to the designers' hearts, just like a painting is to its artist. And for some, it is more than just a business. “Our inspiration to launch a 14th August collection was to reignite the Independence spirit, to not limit this day as just an excuse for a holiday but to take a moment and realise how lucky we are to be Pakistani,” Rama Siddiqui told Kolachi.